I love Honey and Clover, it's such a simple, slice-of-life shoujo story. 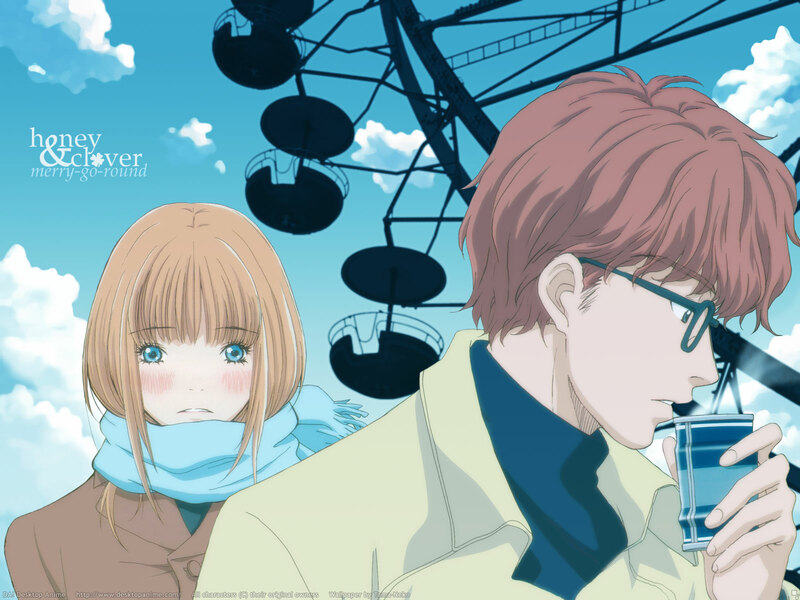 When I saw this lovely scan I knew I wanted to wall it, because I loved the episode where they went to see the Ferris Wheel at the amusement park. Despite that, I titled the wallpaper "Merry-go-round" because it fits Yamada's love for Mayama -- it goes up and down, and round and round, and yet never progresses anywhere. Poor Yamada. The clouds in the sky were taken from a former wall of mine (Promise) and the Ferris Wheel stock came from Stock Exchange. I really love this anime as well. Anyway, very lovely wallpaper I love the sky and the ferris-weel reminds me of the one we get to see in the ending credits of the series. Honey & Clover is indeed rad. As such, I'm glad to find walls of it, like this one. It captures the airy feel of the anime wonderfully. And, like I said in commenting on the scan that you walled here, <3 Iron Lady. =D Fantastic work, Tama. Nice work as alwyas girl! thank god, finally a honey & clover wall. i have to say this is probably one of the best shows i have ever seen imo. did a real nice job here, love how you outlined the scan, not even sure how to do it that way but it looks damn nice. As usually, everything is top-notch. Great images look even better on great wallpapers :). YAY I finally found a decent one, huzzah FOR YOU -bows down- totally awesome, ^^ I love that anime so I 've been searching forever! thank you for a nice wall of one of my fave animes! thanks so much for sharing. poor yamada, i hope she ends up with Nomiya. Absolutely gorgeous... and not just because it accurately depicts Mayama as an oblivious moron. Merry-go-round?! XD It is a Ferris Wheel! Gracias por compartir, gran imagen.